As I’ve been praying about what to share today, God put on my heart something that is true for all of us. Men, women, children. Whether things are going well, or they’re rough right now, we all need to be reminded of our desperate need for a daily connection with him. I have to admit, I’ve been going through a bit of a dry patch recently when it comes to my connection with God. If you’ve been a believer for very long, I’m sure you can relate. I think I’ve been in a place where I’ve been attempting to rely on my own strength and God-given gifts rather than relying on Him, the true source of strength. Don’t worry- I haven’t totally gone off the rails. It’s just that sneaking suspicion that I’ve gotten a bit lax in my habits and the consequences are creeping into actions and attitudes. One of my favorite devotionals to read is a free resource from Seedbed called The Daily Text. This week, writer J.D. Walt launched into a new study on prayer. One of the first reflections reminded readers that "To pray as a Christian means immediacy of access to Jesus, who is right here, right now." He prays, “Open the eyes of my heart that I might know you all at once high and exalted yet nearer than my breath. Right here, Jesus. Right now Jesus.” This prayer has reminded me that I need to connect without ceasing to the one who is the very source of my breath. I took this grapevine photo on a trip to Sonoma years ago. It's an imperfect favorite! Many of you know my parents, Jack and Donna Earley. They’re not here today, so I feel a little safer sharing something with you. You see, my parents are master gardeners. They’ve passed on this hobby of playing in the dirt to me, although I am not nearly as skilled as they are. A few years ago, my dad discovered bonsai trees. Every member of my family, upon glancing at this poor little tree has said “That tree needs PAPA!” and they’re right. It’s going to pay a visit to the master gardener when he gets back home. The tree is a reminder, though. It doesn’t take long for any of us, when disconnected from the source of life to wither. He is closer than even our breath, we just need to reach out to him, for he is truly right here, right now. He wants to sustain us and give us life to the fullest. My prayer for all of us today is that we will draw nearer to the giver and sustainer of life. Ladies, we want to honor all of you today by giving you a flower to take home. After the service, please feel free to come forward and choose one take with you. After what I shared, maybe it will also be a somewhat comical reminder to you to not only water this little plant, but also connect to God each day! **TREE UPDATE! 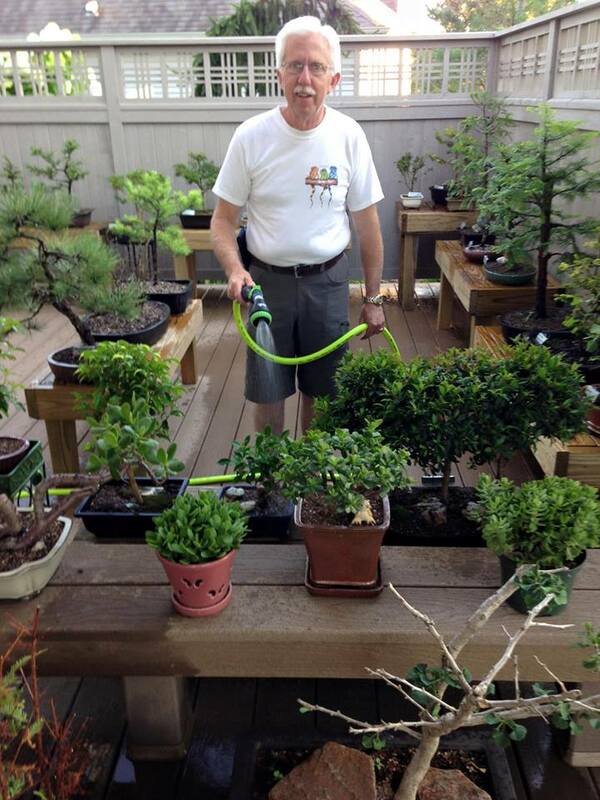 The little tree, in the hands of the master gardener is recovering. I'm still fielding questions about it from concerned friends at church.